Stunning Rare Lilac And Black Tri Female. I have two beautiful small. high quality little girls available. A gorgeous Black tri. and a stunning rare lilac. Mum is 5lb and dad is 4lb. so they won..t get very big. . at the moment they are just half a Pound. 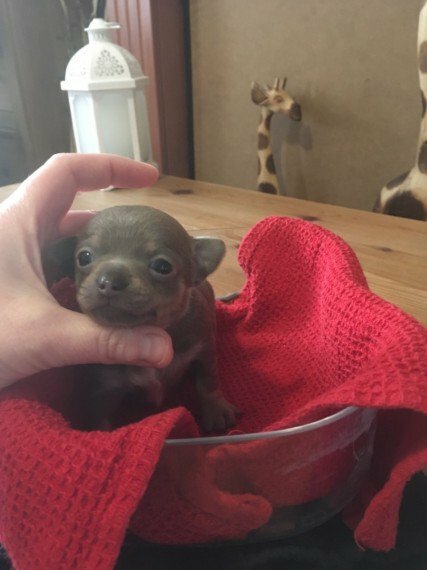 They are currently 4 weeks old. and will be ready to leave around 5th December. . but I can hold longer if needed.. .They will come KC registered. with their 5 generation pedigree certificate from the kennel club. . if reserved early enough. new owners can choose their kennel club name to put on their certificate. .They will come with 4 weeks free health insurance. .They will be vet health checked and come with a letter from the vets stating they are in good health. .They will be regulaly wormed and precautionary flead. .They will come microchipped. . They will have a fluffy blanket scented of mum and litter mates. to help them settle into their new home. . 4 days worth of the high quality food they have been weaned onto. and a 5 off voucher for the next bag of canagan. .Some puppy pads. . A chew toy. .A personalised food bowl. .Some treats. .A tiny little harness. These little babies have had the best start in life. and have had no expense spared on them. I chose the best quality stud. for health. looks and temperament. They are brought up in our family home. where they are loved and cuddled. they have beautiful temperaments. just like their mum. who is very laid back and friendly. and can be seen with them. They will be well Socialised and used to all household noises. they have already started toilet training. and are mostly using the puppy pad at 4weeks old. and I aim to get them fully trained to go on a puppy pad and started to go outside by the time they are ready to go to their new home. They will have started learning basic commands such as ..sit.. ..wait.. and .. come on... also ..go potty.. .which is the command word we use for training to go to the toilet outside.. My aim is to make the transition into their new home as smooth and worry free as possible. so once a reservation fee of 200 is put down. Their new family will be sent regular updates. picture.videos. FaceTime. and are always welcome round for a cuddle of their new pup to build a bond. I am happy to answer any question and I will always be available for any help and advice. Please don..t hesitate to ask if you have more questions. .... The beautiful black tri is 850 The stunning lilac is 1.200. I look forward to hearing from you.